You are here: Home / 4 Gen / 2018 The Four Gen Awards: Celebrating Clean Energy and Sustainable Solutions! 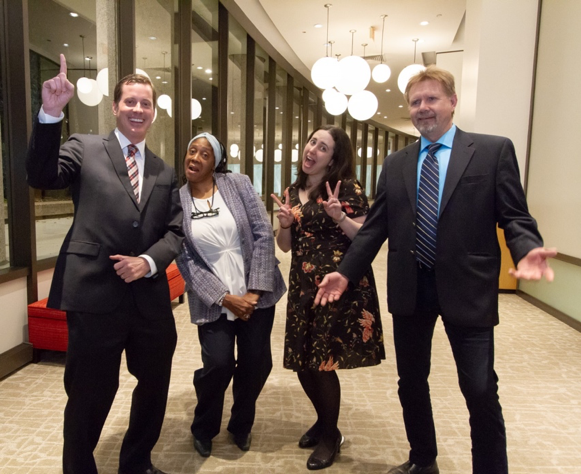 On November 30, 2018, Leaders in Energy (LE) held our 5th Annual Four Generations of Leaders in Clean Energy and Sustainable Solutions Awards and Holiday Celebration! This special event reflects on the current state of clean energy and sustainable solutions in industry, government, nongovernmental organizations, academia, and within communities. Each year Four Gen celebrates individuals from four generations who have become transformational leaders of projects, programs, initiatives, and innovations – helping us to advance toward technological, economic and social solutions for the health and benefit of our planet. Dr. Herman Daly – World War II Generation. Renowned pioneer in ecological- and steady-state- economics. Emeritus Professor at the University of Maryland’s School of Public Policy, co-founder of the journal Ecological Economics, and author of hundreds of articles and numerous books on these topics. 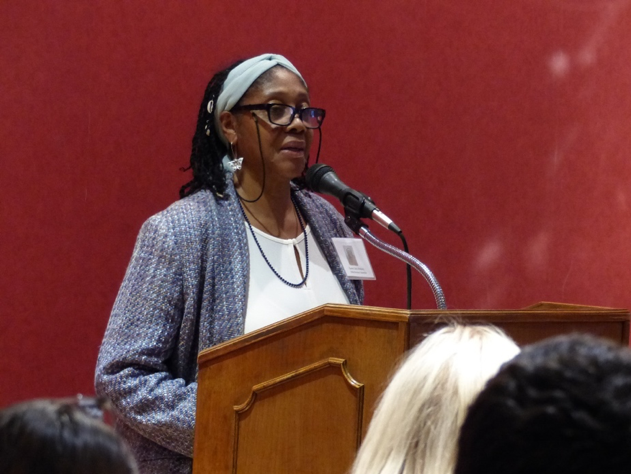 Queen Zakia Shabazz – Baby Boomer Generation. 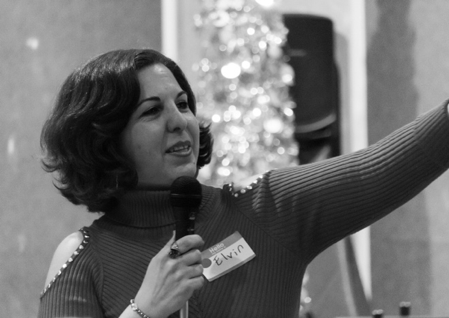 Coordinator of the Virginia Environmental Justice (EJ) Collaborative, a network of environmental organizations tackling a variety of issues in diverse geographies throughout Virginia. Also founder of UPAL – United Parents Against Lead & Other Environmental Hazards. 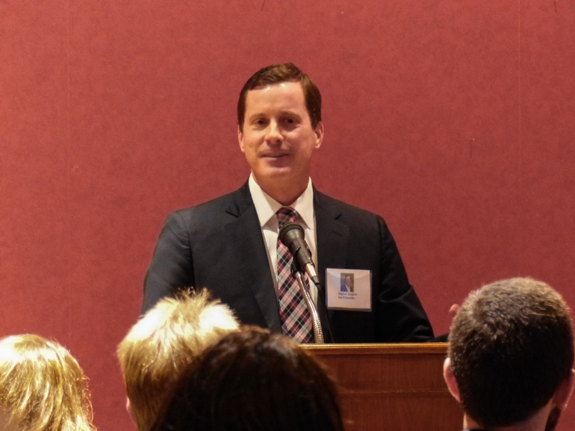 Stephen Coughlin – Gen X Generation. President and CEO of Fluence, a joint venture between AES and Siemens that has deployed nearly 700 MW of grid-connected storage projects in sixteen countries around the world. Lindsey Shaw – Millennial Generation. 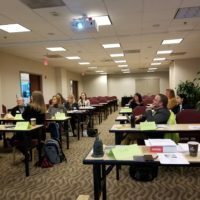 Commercial Energy Program Manager at the Montgomery County Department of Environmental Protection. An innovator of cutting edge programswho works with building owners, property managers and building tenants on energy efficiency and renewable energy programs, including the County’s benchmarking and transparency law and commercial PACE financing tool. Ms. Janine Finnell, Leaders in Energy’s founder and Executive Director, welcomed the audience to the Fifth Annual Four Gen Awards. Janine shared the original inspiration for the Four Gen Awards: The power of multigenerational leadership and talent, and the need to harness the talent that exists among all ages, in order to transition to more sustainable energy and economic systems that will not put our critical planetary life support systems in jeopardy. The theme this year was “Becoming a Leader… Empowering ourselves and others to create a better and greener world,” and recognized people who have demonstrated great initiative, and who took up responsibility, in order to make a difference for clean energy and sustainable solutions. 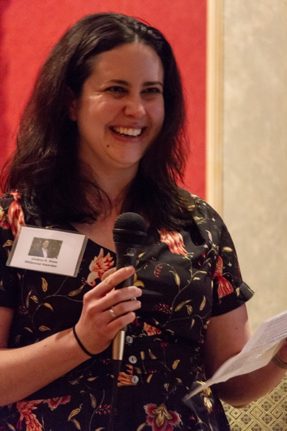 Janine thanked the LE Board, Core Team, Advisor members, volunteers, and the attendees for supporting this event and all 2018 events, and spoke about Leaders In Energy’s mission, career resources, and programs, and upcoming events. She announced that LE received an award from the Maryland Clean Energy Office this year for demonstrated commitment to a clean energy economy in the DMV region. 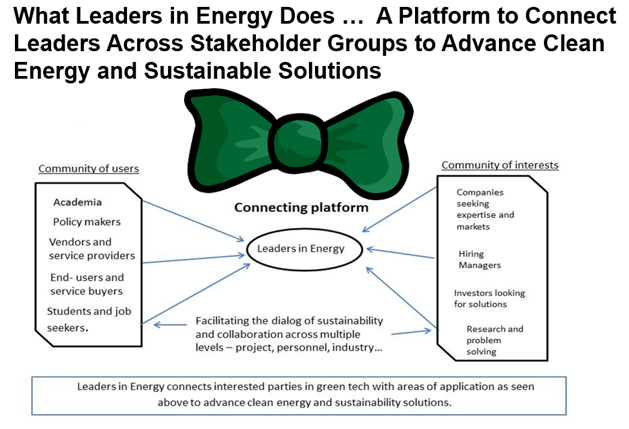 The “Bow Tie” diagram below (Figure 2) is an analogy for what Leaders in Energy is serving to connect (the “knot” in the bow tie) among stakeholders seeking to advance clean energy and sustainable solutions. And Now the Awards Presentation! Dr. Brian Czech began by noting that the awardees tend to be doing the hard work with their head down and it is encouraging to attend an event where we “stop and smell the roses” or acknowledge our accomplishments. Brian then gave us more insight on Dr. Herman Daly and his mentors such as Nicholas Georgescu-Roegen, where he learned the laws of thermodynamics, and Bob Goodman at the University of Maryland. Brian shared that Dr. Daly’s leadership principles feature intellectual rigor, integrity, and long-term thinking. 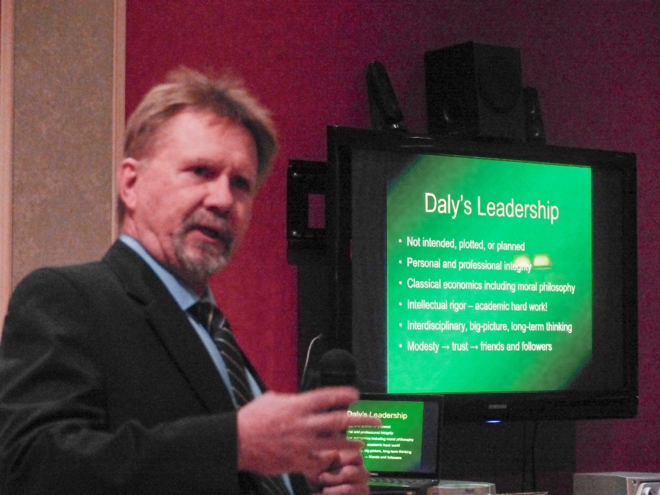 He said Dr. Daly’s inherent modesty generates deep trust from his friends and followers. Dr. Daly has a long list of accomplishments including a stellar career, author, and numerous awards. Brian also provided an overview of the Center for the Advancement of the Steady State Economy (CASSE), on which Dr. Daly is on the board of. Brian warmly says that it follows the “Dalyist school of economic thought”. Brian wished the other winners congratulations on Herman’s behalf, adding that they “should be very proud of their accomplishments and to keep up the good work.” Brian thanked Janine and the audience for their time. 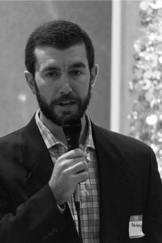 Watch Brian Czech’s presentation on the Leaders in Energy YouTube Channel. 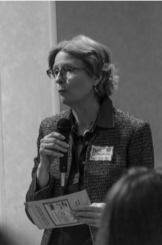 Beth Offenbacker, Leaders in Energy’s Director of Training and Development, recalled that Gloria Steinem said social justice movements occur when people sit together, sharing similar life experiences, and decide that “we need to take action.” With Ms. Queen Zakia Shabazz’s work with Virginia schools, and the Virginia Environmental Justice Committee, Beth was inspired by Queen’s demonstrations with speaking truth to power and encouraging others to join her to do the same. Queen reminded us that we are in this together and we are all “from earth.” Early on, she was inspired by a neighbor, Ms. Anna, in Brooklyn, NY, who preached against the drug dealers due to losing her child to the opioid epidemic. Ms. Anna gained community support over time and eventually the drug dealers were shut down. “She had purpose,” Queen said. Ms. Shabazz concluded with gratitude. Watch Queen Zakia Shabazz’s remarks on the Leaders in Energy YouTube Channel. Leo Perez, Leaders in Energy member, introduced Mr. Stephen Coughlin. He shared some of Mr. Coughlin’s accomplishments, in particular his leadership of the transformative organization, Fluence. Stephen began by describing how Fluence is a joint venture by AES and Siemens to bring together their experience in owning and operating energy assets to pursue a variety of energy storage technology solutions. Fluence has installed over 120 MW hours or 24,000 homes’ worth of power throughout the world, yet the grid was not built for storage. He noted a few industry inefficiencies: costly peaking plants run for a few hours on select days throughout the year, and the most cost effective renewable energy resource is solar. However, solar is not available every day. Storage can alleviate these grid issues by bringing in predictability and reliable capacity. In a subsequent interview with Stephen, he shared that although practicality in his early career led him to a stable job, he knew he wanted a greater sense of purpose in his work. He expressed how much he and his family enjoy the natural environment and wishes for a future just as bright for his children. He took his financial analysis skills and joined AES’s wind generation business. As he moved up in the company, he found that his portfolio included some technologies that he was uncomfortable with – but he also found he had positional power to act. 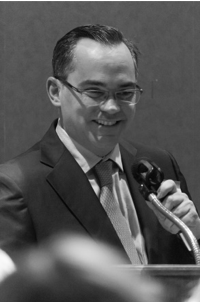 After discussions with AES’s CEO and Stephen’s mentor, Andres Gluski, AES began to measure their carbon intensity and developed a strategy for carbon reduction. Systemically, they began to focus on renewable development. Then Andres Gluski asked Stephen to lead a team of entrepreneurs deploying battery storage across AES’s portfolio. AES found a partner with Siemens, as they are a company with presence in 160 countries. The two groups formed Fluence, which provides an agile avenue for rapid storage deployment. Be willing to work close to the problems you are trying to solve; be willing to have access to the solutions. Look for influential sponsors and mentors to help achieve your goals. Stephen credits his success to his relationship with the AES CEO, Andrews Gluski. Look for partners that compliment what you are doing. See Stephen Coughlin’s Four Generations slides in the LE Event Archives here. Lindsay began by saying that we don’t acknowledge how energetic, open-minded, and innovative Millennials can be, and continued to say that she admires how innovative the MoCo DEP can be, as the first jurisdiction to declare a climate emergency with an accelerated goal of eliminating greenhouse gases entirely by 2035, among other landmarks. “Local government is where all the action happens!” she said. Lindsay said that she has been fortunate to work on some of these projects and to develop her own projects. She is glad to demonstrate that state and local governments can have a creative side. Engaging with building managers and the community is the first step towards reaching policy goals and she is excited to continue working with them. “Small victories are worth celebrating,” she told the audience. She does not believe that mandating change is the only way to make change possible, and said that stakeholder engagements can shape policy. 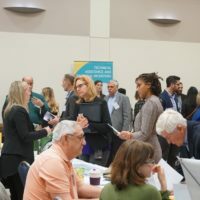 Private sector, nonprofit organizations, and other partnerships are key to the success of some programs, such as the commercial energy program and the upcoming Montgomery County Energy Summit on Wednesday, April 3rd, 2019. Watch Lindsey Shaw’s presentation on the Leaders in Energy YouTube Channel. Walking the Talk – Making Four Gen a nearly Zero Waste event! 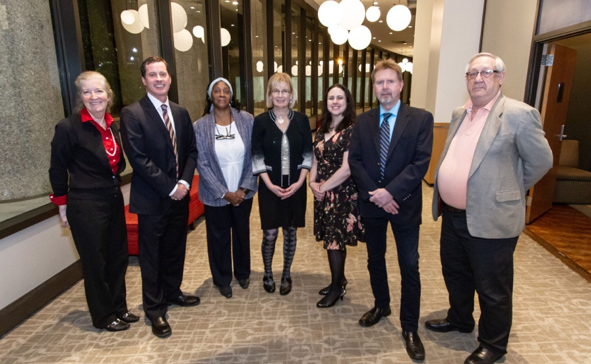 Leaders in Energy (LE) has been involved in working to build a Circular Economy in the greater Washington region for several years. In 2018, LE formed the Circular Economy (CE) Working Group, which holds monthly meetings on this topic. The CE Working Group looks to implement circular economy policies and practices to help move our region away from a “throwaway society.” Dr. Clifford Deaton is Chair of the CE Working Group. Learn more about LE’s circular economy activities here. Naturally, LE wanted to “walk our talk” at the Four Gen Awards! Our goal was to have a zero-waste event. 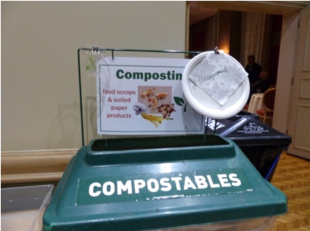 Over 80 attendees tossed their plates, utensils, and excess food into recycling, compost, or trash bins. Volunteers then sorted the recyclables and we kept 61 pounds of materials out of the landfill — 10 pounds of food waste and 51 pounds of recyclables. Dr. Elvin Yuzugullu, Leaders in Energy, Director of International Sustainability and member of the Circular Economy Working Group describing the measures that LE had put it in place to make Four Gen a zero waste event. Many thanks to Dr. Elvin Yuzugullu, Candice Guillaudeu, and Leila Peck (on LE’s Circular Economy Working Group) for their work in hosting a zero-waste event. A special thanks also goes to Shani Krujac (with Arlington County) for the use of the County’s in-vessel composter to make this a zero waste/circular economy event. We want to give special thanks to our Sponsors and to Doorprize Benefactors! Thank you to our Clean Leader sponsor – Longenecker & Associates! 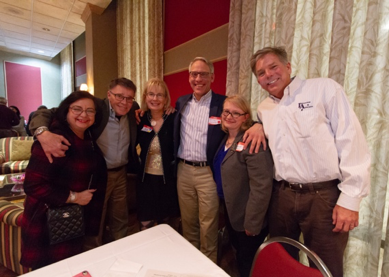 Leaders in Energy is grateful to Longenecker & Associates (L&A), and Keller Staley VP of L&A, for their long-time support of the Four Gen events. 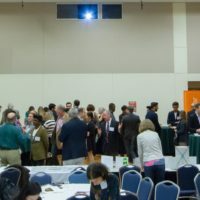 Many thanks also to the sponsors who contributed this year’s fabulous door prizes: books on energy management, green buildings, and a biography of Nikola Tesla; tickets to local energy and environmental events; and many more. 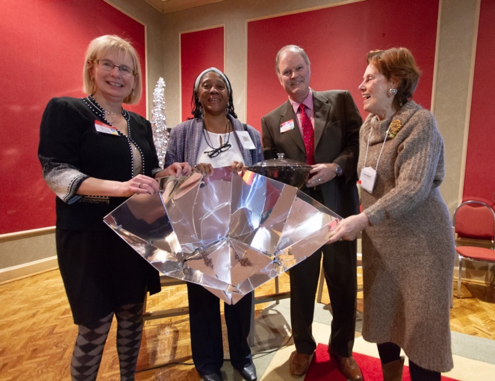 In fact, LE was delighted to see one of our 2017 Four Gen awardees, Louise Meyer of the Solar Household Energy (SHE) organization, who generously donated a Hot Pot solar oven as a door prize this year! (See all our sponsors listed below picture). Our Benefactors sponsors were: Association of Energy Engineers; National Capital Chapter (AEE NCC); Career Confidence; Center for the Advancement of the Steady State Economy (CASSE); Clean Energy Business Network; DC Net Impact; Green America; Green Business Roundtable; Mili Salon; One Montgomery Green; Potential Energy DC; Resilient Virginia; and Styrofoam Mom. And finally, our sincere thanks all attendees for supporting the Four Generations Awards as well as to our fabulous LE volunteers! 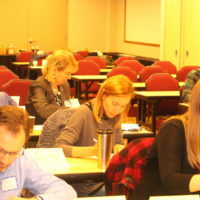 LE is building a community of engaged leaders to create a sustainable energy system, economy, and world. The three main areas of action are the green economy, sustainable communities, and multigenerational leadership. With operations in Metro Washington DC, we’ve built a base that spans most major metropolitan areas and over 100 countries. We invite you to join our community at https://www.leadersinenergy.org. Kerry Worthington is a Senior Manager at National Association of Regulatory Utility Commissioners and serves as an Advisor for Leaders in Energy. She began volunteering for LE in spring 2015. She is a young professional working in the state regulatory space, specifically on multi-state issues. Transmission system planning and analysis from a policy point of view has been her focus area for several years, and she is growing into the distributed generation area with an eye on environmental topics. Carol McCaffrey is a versatile communications expert with experience reaching audiences through theatrical film projects, national retail advertising, marketing communications, non-profit program development, and as an actor. The principles of respect for audience, communicating with truth and integrity, originality and genuine value, apply to all her work. Carol is an environmentalist and animal advocate; a vegan who believes in native planting where we live and picking up trash wherever we go. 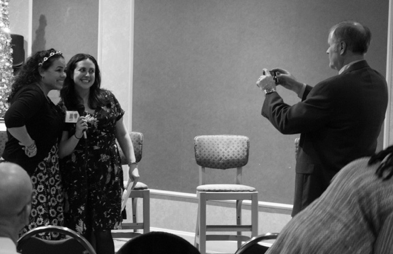 Photos and videography were provided by Nick Hansonwith FilmBison Media and supplemented by Pareesa Vahidi, LE volunteer and Janine Finnell, LE Executive Director. NOTE: A copy of the Four Generations slide presentation is available at the LE Event Archives here.